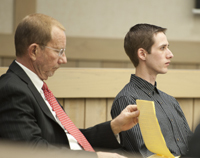 A Blaine County jury deliberated a little more than an hour late Thursday afternoon before determining that a 30-year-old Hailey man acted in self-defense when he shot another man in the abdomen the evening of July 13, 2013. In delivering its verdict, the jury found that Adam Keith Boyd was not guilty of aggravated battery, a felony, for shooting 29-year-old Anthony Parsons, also of Hailey, during an altercation near the Subway sandwich shop on Main Street. The verdict brought to an end a three-day trial before presiding Judge Jonathon P. Brody in Blaine County 5th District Court. Both Boyd and Parsons testified at the trial. Boyd claimed that he was trying to defend himself against Parsons, who, Boyd said, had slammed his head into a car, knocked him to the ground and kicked him while he was down. Parsons testified that Boyd and an associate, Nathan DeFord, 25, of Hailey, were the aggressors and that he got shot while trying to disarm Boyd. After the shooting, Parsons was flown in critical condition by emergency helicopter to Saint Alphonsus Regional Medical Center in Boise. He was treated at the hospital for about two weeks before being released. Hailey attorney Keith Roark, who was assigned as public defender for Boyd, said in an interview Friday that the jury’s verdict weighed heavily on credibility and that the jury decided Boyd was telling the truth. Roark said it was unfortunate that Boyd spent about six months in jail. He was released in December after posting bond that was reduced from $75,000 to $15,000. Blaine County Prosecuting Attorney Jim Thomas issued a written statement to the Idaho Mountain Express on Monday.